Want to learn implantology from A to Z? Lectures More than 90 lectures given by leading international experts. Learn oral implantology from A to Z. Cases Clinical cases comprehensively documented from inital examination to final outcome. Make your own case planning and compare with treatment executed. Courses Information about specific topics. Gain profound knowledge about a subject of your choice. Media Center Large collection of clinical videos, documents, posters as well as lectures, courses and cases of the platform. Find your individual learning offer. Dental Campus offers Lectures, Clinical Cases and Structured Courses. An extensive Media Center and search functionality allows you to find all material on the site. All contents are peer-reviewed by a global board of renowned experts in the field. You can redeem CE Credits and get a certificate upon successful completion of exams in courses and lectures. Enjoy the content the way you want. Look for specific tips from your peers? Watch videos in the Media Center. Learn Implant Treatment from Start to Finish! More than 100 E-learning lectures taught by experts. The lectures are sanctioned by exam and CE Credits. Clinical Cases with detailed visuals and techniques - from initial exam to final exam. Create your own individualized treatment plan from a comprehensive case library. Structured didactic courses like Soft Tissue Management. One time Payment. Learn at your own pace pass the exam, redeem CE Credits and get a certificate. 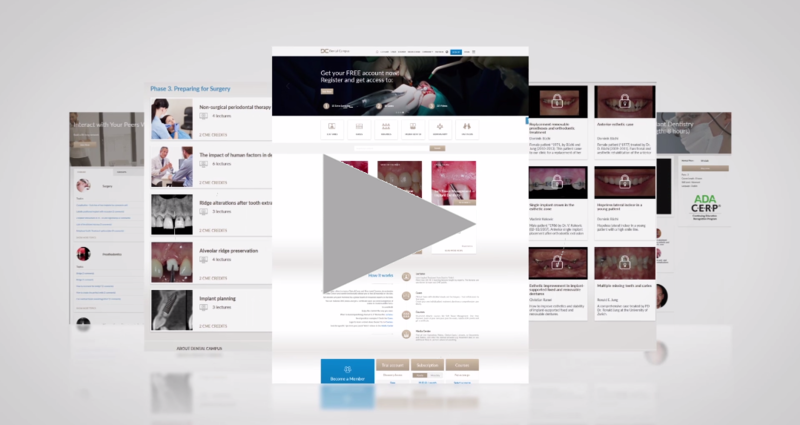 Find all Live Operations Videos, Clinical Cases, Lectures, or Documents and Posters. Just enter the desired keyword (e.g. treatment plan) or use additional filters to perform advanced searching. *Automatic membership renewal. Cancellation possible up to 30 days prior to renewal.